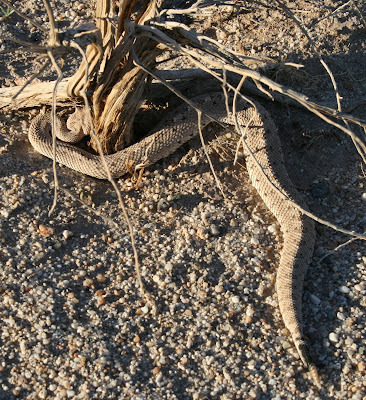 This is the second snake and the only rattlesnake we have seen in the field here. Though the daytime highs are in the 80s, it’s still only in the mid to low 40s at night and I think these fellows are still pretty torpid. This one never moved (other than a couple of tongue flicks) for the ten minutes or so we were around. 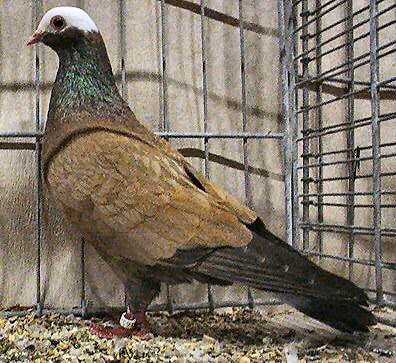 This guy is fairly young I guess, look at the tiny rattles. Really pretty fat though, isn’t he? 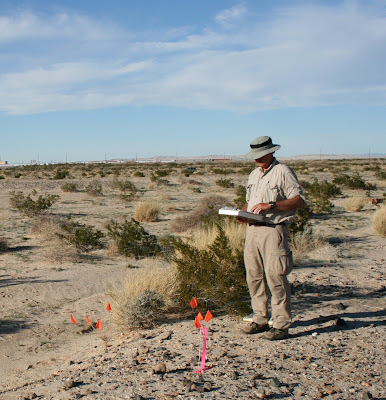 “… my education is in evolutionary and ecological biology, though much to my chagrin I’m not working in the field right now. (Long dull story, and I don’t much want to talk about it anyway.) I’m married, old enough to feel old from time to time but young enough that I still tend to feel like a whippersnapper in the blogosphere at large, and no I’m not putting up a picture. Interests likely to appear in this space are guns, politics, science in general and biology in particular, odd history, dogs (more in-depth than just “mine are cute”, though anticipate some of that, too), pop culture, food and liquor, tattooing, and whatever else strikes me as the most likely source of the day’s drivel. If I’m feeling particularly obnoxious fitness and nutrition may appear. You can see why we like her. 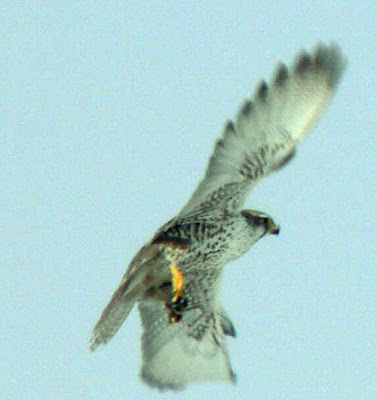 In his monograph on the Gyrfalcon Eugene Potapov confirms that, in the high mountains of Central Asia, there are areas of hybridization between those recently and imperfectly separated species, the Gyrfalcon and the Saker. 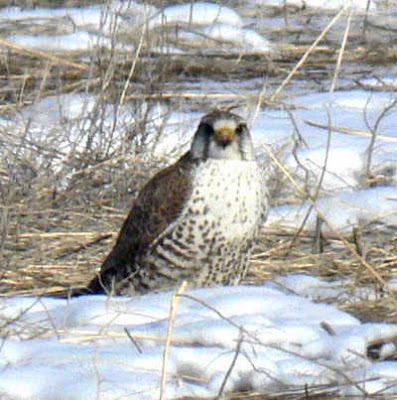 These are doubtless the semi – legendary “Altai falcon” or Shunkar of classical falconry. I made a probable sighting on my first trip to Mongolia, in February. 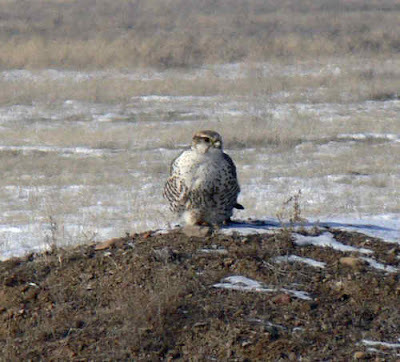 Last week, my friend Andrey Kovalenko of Almaty, Kazakhstan, ornithologist, sometime falconer, and “dog- in- law”, saw and photographed another likely specimen while hunting in the steppes north of town. 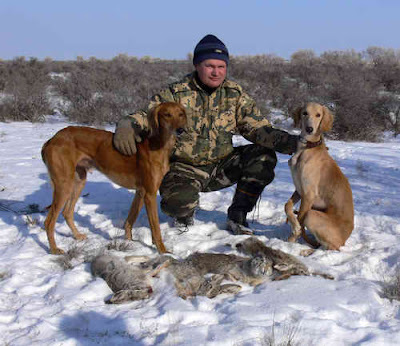 And here is Andrey with quarry from the same hunt. The tazi on the left, Berkut, is father of my Kyran. I’d really like some feedback on this one. In his excellent (and not at all snobbish) food blog “Bitten”, which I discovered via Rod Dreher, NYT writer Mark Bittman presents the now – notorious viewpoint of English celebrity cook Delia Smith. “Delia Smith, probably Britain’s best-known and best-selling cookbook author, says celebrity chefs should stay away from “politics” (which I take to mean everything except cooking) and that the “obsession” with organic produce is counterproductive. “In her new book, “How to Cheat at Cooking,” she then goes on to advocate tinned mince and frozen mashed potatoes, explaining that her priority is making sure that poor people get to eat rather than worry about whether consumers live up to the standards of celebrity chefs. “Hmm. I get that poor people don’t need to obsess about organic ingredients; I get that neither poor people nor anyone else needs to cook like celebrity chefs (or, in some cases — television being what it is — the way celebrity chefs pretend to cook). And I get that the gap between — let’s call it upscale — food and junk food is wide, and needs to be bridged. Now: look at the war raging in the comments. Most of the commentors, and to an extent Bittman, miss the point. Today, it is not rich vs. poor– it is educated vs. uneducated, readers vs. non- readers. It can be very cheap to eat well– we do. But we READ, including cookbooks, books like Michael Pollan’s, and blogs like Bittman’s. My much richer parents ate 1950’s crap– a lot of utterly awful stuff, though thank God we had my grandparents, and fresh seafood. America has lost the habit of eating well in the “vernacular” sense. Educated people, whether rich foodie snobs or poor crunchies, are trying to do things differently. But how do you change the habits of the “masses” without nannyish interventions? The diet eaten by local Native Americans defies belief–bulk commodities, fast food, candy, pop, and beer. Some have told me they will never eat a vegetable. Navajos themselves joke about the 250 -pound “commod bod”, and diabetes is rife. So how to get past this? I see one fascinating sign right here in Socorro County. The local unaffiliated supermarket, the holdout of old people against Furr’s and Wal-Mart, has always been the place to buy carne adovada, sheep heads, and tripe. Now, while keeping such things, they have suddenly added all manner of “natural”food, organic and free- range meat, fresh produce, and other things one would previously have had to drive 100 miles to Albuqueque to get. OK: as usual I am reading about eight books but the nearest physically is John Ure’s In Search of Nomads. “The one thing he did not attempt was to follow the Bedouin practice of riding a camel perched on the saddle in a kneeling position; unsteadiness and the prospect of a cramp made this an impossible feat for a European, particularly if he might need to shoot at game while on the move. Possibly more than any European traveller with the Bedouin, ——– became absorbed in their ways and by his writings acted as an interpreter between them and the Western world. My co- bloggers and everybody else are cordially encouraged– I don’t think you are supposed to tag yr. partners. 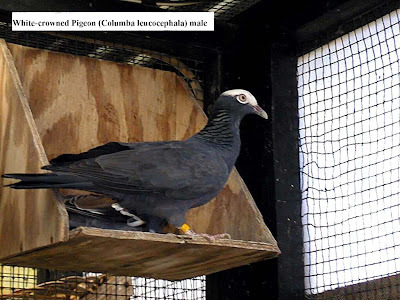 Reader Mike Spies, who has a place in Jamaica, noticed that wild White- crowned pigeons (Columba leucocephala) resident there resembled some white- capped Catalonian tumblers he had seen on the blog. 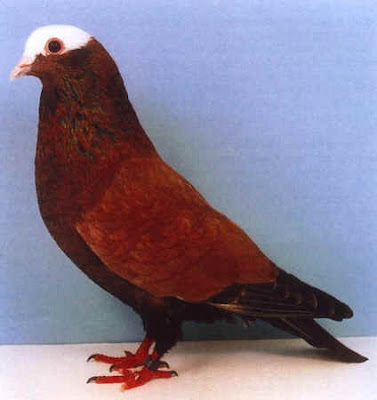 Of course, “Cats” are only one of the myriad breeds of Darwin’s pets, domestic pigeons descended from the Rock dove (Columba livia.) But the resemblance can be remarkable. ..and here a bronze one. I thought, having seen them in the Virgin Islands,where they seem to live high in trees, that White Crowns were much bigger than the tumblers, but Mike assures me that they are all wing and feather. Good eating though! In the fascinating blog “ERV”, scroll down the post to the header “Tard Fight”, where blogger S. A. Smith gives us the edifying spectacle of two creationists bashing each other over Animal Rights, one arguing that if evolution is right then so is PETA and the other, I guess, that Jesus was a veggie and Meat Is Murder. ! I think readers of this blog can agree with Ms. Smith that these two are idiots. But the post got me thinking that there are three ways that evolutionists (who may or may not be secularists- as I have noted before, there are plenty of straight- up, non “ID” evolutionists who are also religious– some even read Richard Dawkins!) could approach eating other animals. One: we are all of equal value and everybody eats everybody. It is called the ecosystem. 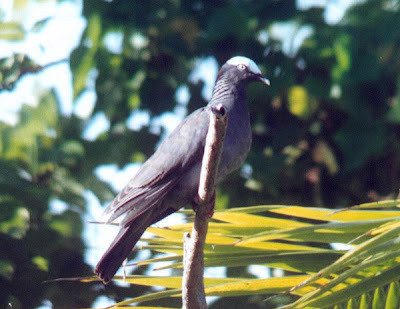 Two: humans have at least one unique quality, speech (please don’t email me about parrots and especially chimps– I am just following accepted consensus science here, albeit somewhat nervously with African gray parrots– I wouldn’t eat one!) And also (NOT “therefore”) you can eat other species. Call this “soft speciesism” which is practiced by all species– putting their own species first. I find the premises of ERV’s competing Christians absurd, propositions one and two both sane and sensible, and number three utterly sinister. A movie I must see: a so- called “Mongol Western” about Chengiz. See also here; director Sergei Bodrov has also made a Kazakh epic. The best way to handle invasive species. I want his forthcoming book– his last was very good. Peculiar has an interesting take on mining and”NIMBY”. If there is no molybdenum mining, where will the yuppies who hate it get their skis and trail bikes? I need to check with reader Mike Spies to get a lost link on proposed new dog legislation in Connecticut. Basically, their SPCA is pushing for mandatory spay- neuter, while importing dogs from out- of- state and selling them for $300. You can’t make it up! UPDATE: Margory just provided a link to the story cited by Mike. I just got around to posting a couple of Steve’s pics in a blog below “Seasons Change.” Scroll on down and check it out.